The era of coal is over. We must demand a just transition for impacted families and communities now. APS, having profited billions from the hardworking families and communities of northwestern New Mexico, has a responsibility to help fund that transition. Below is a well-written piece written by the president of our Board of Directors, Gary Skiba, and the Carol Davis, Executive Director of one of our close partners, Diné CARE, on what that should look like. Decision-making about Arizona utility bills doesn’t generally make even the back pages of news coverage in New Mexico. Recently, Arizona’s biggest utility went before state regulators seeking a $400 million rate hike New Mexicans would be wise to pay attention. That’s because discussions included the Four Corners Power Plant (FCPP). The plant, located on Navajo land outside Farmington, came online when Richard Nixon was president, and that makes discussions about planning and support for its eventual retirement highly relevant to New Mexico. Whether it’s in a few years or a decade, Four Corners will close someday. Our grassroots organizations work with people who live near the plant, and we are participating in this proceeding to ensure a fair, responsible planning process for the eventual closure of the facility, even if that date isn’t known now. FCPP’s first three units were built in the early 1960s. At one time was, it was one of dirtiest power plants in the country, and those units were taken offline five years ago as part of a settlement to cut pollution. 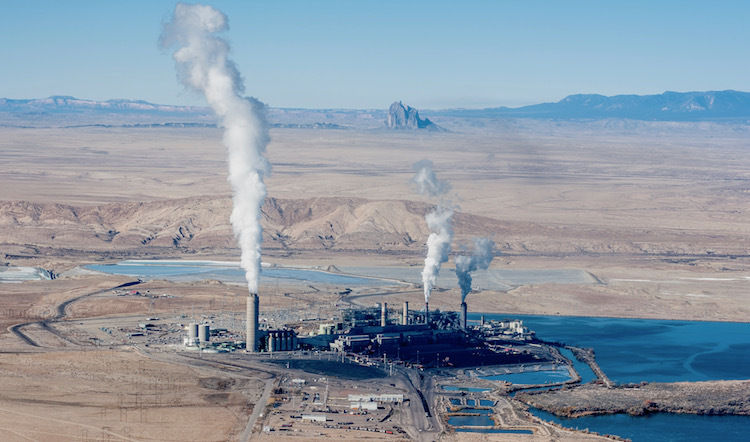 The two “newer” units began operating in 1969 and 1970, and earlier this year, Arizona Public Service completed installation of more than a half billion dollars of pollution controls to allow the plant to keep running. Now it is asking for a rate increase to cover the costs. While there are certainly questions about the wisdom of spending so much on an aging plant that New Mexico regulators have determined is no longer economic, we leave that debate to utility customers in Arizona. We are focusing instead on APS’s responsibility to the families and businesses of northwestern New Mexico, whose hard work and dedication have allowed the company and its shareholders to earn billions of dollars over the past half century. Those obligations need to be kick-started now so that nobody is caught off guard by a surprise closure announcement in the future. With the two remaining units at FCPP about to turn 50 – the normal life expectancy of any coal plant – discussions about its retirement should be mandatory. APS may be mapping out retirement plans internally, but our local communities, which are directly impacted by the utility’s decisions, have seen nothing publicly from the company to date. Establishing a Transition Fund to provide financial resources to impacted Navajo and non-tribal communities in the Four Corners region. Providing financial support for a Transition Collaborative comprising stakeholders from northwestern New Mexico. Supporting Navajo communities through commitments to transmission access and renewable energy development opportunities on tribal lands, including facilitation of tribally owned and operated projects. Working cooperatively with FCPP’s other owners to develop energy efficiency programs to benefit tribal and low-income communities and customers. Assisting the Navajo Nation in economic development efforts that bring electricity infrastructure to tribal communities, including service to the roughly 18,000 Navajo homes that currently do not have power. There is a growing realization by utilities that they have responsibilities to assist communities in transitioning to what comes after coal. In Montana, the majority owner of another of the West’s biggest power plants has committed $10 million to help the town of Colstrip begin mapping out its post-coal future – even though the plant’s retirement is likely a decade away. We think it is more than reasonable to hold APS to the same standard. The energy landscape is changing dramatically, with solar, wind and storage prices now out-competing coal and natural gas, and the economics are prompting many utilities to make decisions to retire older power plants. Affected communities need – and deserve – to be prepared for such profound economic transitions, which can take years to plan and implement. Now is the time for APS to step to the plate as a responsible corporate citizen – and for Arizona regulators to hold the company accountable – and begin working cooperatively with stakeholders in New Mexico to help create a better future for families and businesses of the Four Corners after the plant closes – whenever that day may come. Carol Davis is the executive director of Diné CARE and lives in Dilkon, Arizona on the Navajo Nation. Gary Skiba is the board president of San Juan Citizens Alliance and lives in Aztec, N.M. This piece originally appeared in the Daily Times here.